This is very simple multiplier which can give you possibility to simply enter the 6cm band at the same time not spending the big $$. The idea was to make a simple multiplier where no tuning is required, just Plug and Pray :-) This approach is very handy for the hams with the basic measuring equipment and counters that can measure up to 1.3 GHz (with old TV prescalers) or maybe for the guys able to buy cheap 2.8 GHz counters from China through E-bay. Measuring higher frequencies with the commercial counters require more expensive equipment and most of the home brewers are stuck on 13cm band. This project is perfect not just for them, but for all looking for a cheap unit working on the 6cm band. As can be seen from the photo, cheap means using double side FR-4 laminate, so no fancy Rogers, Teflon, alumina etc. Only two active devices, cheap and e-bay available MMICs, a few SMD resistors and capacitors and one voltage regulator. Of course, microstrip filter is printed on the PCB. This should be cheap enough and still working ! The design is quite old fashioned already proved where saturated active device produce output rich with the harmonics. The required harmonic is "extracted" through the filter and amplified with the second active device. This is the all "magic" going around all similar multipliers that you may have seen up to now. The difference may be only in the type of active device used, type of filter and quality of the PCB. The theory of operation is more or less the same. Both active devices are MMIC from Sirenza. 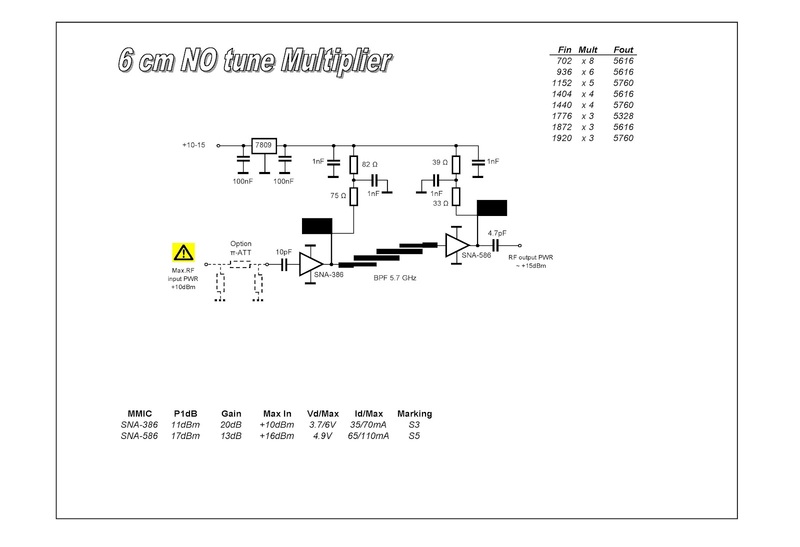 The first one (multiplier) is SNA-386 and the second one (amplifier) is SNA-586. Instead of Sirenza someone can use the ERA-3 and ERA-5 devices with the very close results. I choose the Sirenza because they are cheaper and easy available from the E-bay and on the other side they perform a little bit better then ERA substitutes. It is important not to overdrive the first MMIC (SNA-386) where you can easily blow-up the MMIC if applying more than +10dBm (10mW) of the RF power. To be honest, 7dBm (5mW) is more than enough for successful operation and multiplier is working even with the 2mW drive. In case that you have excess input power you can always use the attenuator at the input. There is enough room left at the input, just before the 1st MMIC to accommodate simple Pi type attenuator made from the SMD resistors. Of course, more expensive SMA attenuator can be used instead. The PCB filter is the exact copy of the S53MV printed filter used in the ZIF transceivers where good results are obtained regarding band-pass, I.L. and band-stop characteristics. The filter is cheap enough, easy to fabricate and will satisfy most of our needs on 6cm band. The PCB is fabricated using the double side FR-4 0.8mm laminate, dimensions 30x65mm. 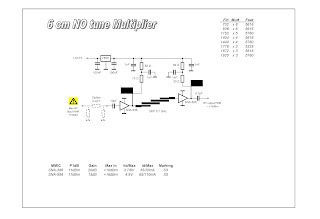 The PCB layout is using S53MV solutions, like band-stop filter (DC bias) and via design technique. Up to now I did not find a better solution that can be done at home lab. For the via, just drill the hole diameter 3.2mm. Cover the hole and solder the peace of brass or copper foil from the PCB ground side. Fill up the hole with the solder. I did try to calculate the inductance and capacitance of such made "via" and the results are very good. As a matter of fact I notice that some commercially made microwave equipment is using similar approach where active component is soldered with the ground pins to the small peace of brass inserted in the PCB slot. On the other side of the brass plate there is M2 thread extending, allowing to secure and screw the brass to the heat-sink or conductive ground pad. The left PCB on the photo is 117MHz to 702MHz multiplier used later with the 6cm no tune multiplier. The PCB's are fabricated using the tone transfer method. The filter traces are still sharp enough, no problems with that. Of course, the filter on the FR-4 laminate will radiate but we need to live with that if we want to use this simple and cheap approach. Most of the components are soldered on the signal layer side except the voltage regulator with associated capacitors soldered straight on the pins. More over, instead of using 1nF pass through capacitors I am running just a peace of wire through the PCB. I cut the small squares using the x-acto knife on the PCB ground side, just around the place where through wire is soldered. From the same pad 1nF SMD capacitors are soldered to ground layer. Insulated wire is connecting the voltage regulator with the through wire pads for MMIC supply. Proper MMIC bias was done using the serial pair of SMD resistors. This way the power dissipation from the resistors was split preventing overheating and burning the SMD bias resistors. I am using 1206 (power rating 0.25 watt) size resistors for the bias. SNA-386 MMIC bias can be done even with the 0805 size (power rating 0.125 watt) but SNA-586 must be done with the 1206 size resistors. Depending of the multiplying factor, somebody would like to play with the bias voltage to obtain the best results and higher output. It is much easier and safe to play with combination of two resistors in bias than just one. After soldering all SMD components, it is important to clean all excess flux from the PCB, specially around the MMIC. This will give you some more power at the end. As this is no tune project, simple power on should be enough for proper operation, but if you want to be sure that there will be no smoke after some time you can always perform a small check. First power on can be done with no input drive and output terminated with the 50 ohms load. Apply the power through the milliampermetar which should read 100mA (+/- 10mA). You can also check to bias voltage and current on each MMIC. When you are sure that all is according to data sheet specs. you can add some drive to the multiplier (stay bellow 10dBm!!). The current will stay almost the same. If you have any means of measuring the output power you can notice that there should be at least 10dBm up to 16dBm on the 5.7 GHz depending the applied input power and multiplying factor. I did not play with the bias resistors to get the best output results because this can work with some frequencies but not for all. Anyhow there is a plenty output power for all purposes. No sign of self oscillations were noted, the multiplier perform very stable even not screened. After all the PCB can be screened in the small metal sheet box same size as the PCB and 20mm high. The PCB is positioned some 5mm from the bottom leaving space for the 9V regulator soldered to the ground PCB layer. Then the ground layer is soldered for the metal housing all around. No sign of strange oscillations nor the box resonance observed at all despite the high MMIC gain. S53MV ground via system is proved to be the best and cheap way in the home brew desk projects. If you are ATV fan this can be the easiest way to reach the ATV at the 5.7 GHz. The Comtech ATV tx for the 23cm can be used with no problems. The frequency can be tuned down to 1150 MHz and after x5 multiplying we have 5750 MHz at the output. Observe the SMA attenuator!! Do not drive the multiplier directly from the Comtech module. The same Comtech unit can be used for the 6cm signal generator. This is the cheap way to generate the required signal for tuning the filters or checking the RL on antennas. All you need is already mentioned Comtech 23cm module controlled with the PIC controller and LCD display. The range from 5-6 GHz is no problem at all. IK8UIF offer handy Comtech controller where LCD screen can be programmed to show x5 frequency already. For all building the 6cm transverter this can be easy way to multiply the 702 MHz signal from the OCXO to required 5616 MHz. This was the lower frequency that I apply to the multiplier that produce enough output level without an extra amplifier at the end. If you need a local mini beacon for testing the 6cm equipment this can be more than enough. Applying well known 1152 MHz signal at the input will result with the 5760 MHz signal at the output. Adding some 6cm antenna the range will be improved up to few km LOS.